Most cypress trees are not for small spaces. Species can reach 100 feet and more in height and can have a crown spread up to 60 feet wide. One exception to the rule, the Italian Cypress, has good height, but is narrow with an unusual shape that makes the tree a good choice for any size property. Monterey cypress (Cupressus macrocarpa) changes shape as it ages, starting out as a cone-shaped tree and developing a broad, spreading crown as the tree matures. The tree grows up to 100 feet tall with a trunk that measures 8 feet in diameter. The tree produces lemon-scented leaves 1/16 inch long that grow pressed against the smaller branches to form feather-like plumes and light tan cones. The tree is salt tolerant and can be planted near the beach, but the trunk will become twisted instead of growing straight. It's best to plant Monterey cypress in full sun and a moist soil. The tree is hardy in USDA hardiness zones 7 to 10. Leyland cypress (Cupressocyparis Leylandii) grows from 50 to 100 feet or more in height and develops a pyramid or column shape as it matures. The leaves lay close to the branches and overlap each other to form flattened sprays. Tiny flowers appear in the winter and are followed by leathery cones. It's best to plant Leyland cypress in full sun or partial shade and a soil that is moist to dry. The tree is hardy in USDA hardiness zones 6 to 10. Italian cypress (Cupressus sempervirens) is also known as Mediterranean cypress. The tree grows up to 80 feet tall with a spread of just 8 feet. The tree produces dark-green, needle-like leaves. Cones only appear when the tree is in a place with cool winters. It's best to plant Italian cypress in full sun and a soil that is moist, fertile and well-drained. The tree is hardy in USDA hardiness zones 8 to 10. Bald-Cypress (Taxodium distichum) grows to 130 feet or more in height and 60 feet wide with a trunk diameter of up to 10 feet. The tree starts out as a pyramid and the top flattens out as it matures. Bald-cypress has deciduous, linear, spreading needle-like leaves that turn a rusty brown in the fall; it also has round cones about 1 inch in diameter. It's best to plant the tree in full sun and a soil that is dry, moist or wet. 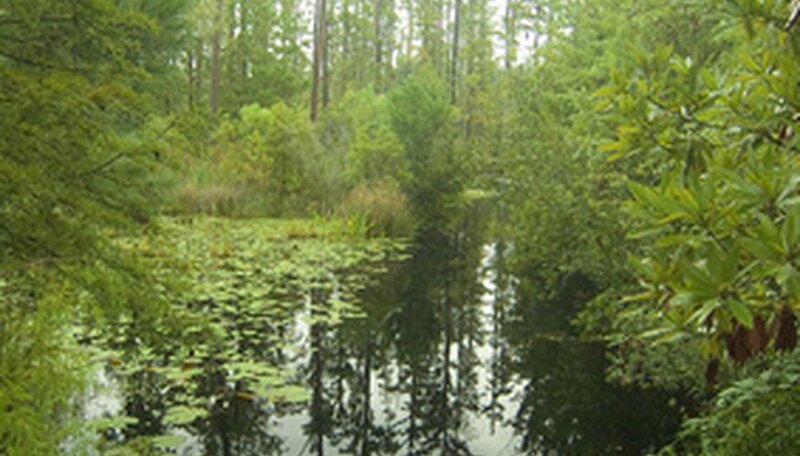 Bald-cypress can stand up to both flooding and drought. The tree is hardy in USDA hardiness zones 5 to 10.